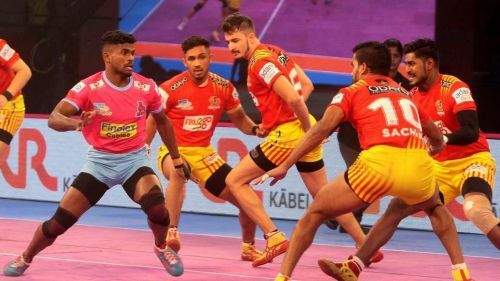 The Jaipur Pink Panthers succumbed to their first loss of the home leg as the Gujarat Fortunegiants romped home to a 34-29 win at the Tau Devi Lal Sports Complex in Panchkula. The hosts, out of the race for the playoffs courtesy of their tied encounter with U Mumba came into the competition with only pride to play for while their opponents needed a win to strengthen their claim for the top spot from Zone 'A'. 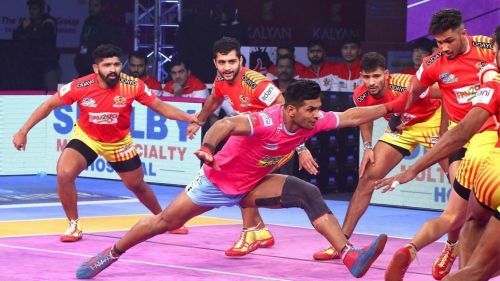 The Panthers were put under the pump early in the first half by Gujarat as the visitors raced away to a 17-9 lead as both teams added a point each to go into the break with the momentum clearly on Gujarat's side as they took an important 18-10 lead. Both teams dealt a blow for blow for the next few minutes before the Fortunegiants were struck by an all-out in the 27th minute as the hosts reduced the deficit to five points. Yet, it was all too late as the visitors held on to their lead to cruise away with a five-point win in the end. The Jaipur skipper failed to replicate his form against U Mumba as he picked up just one point in the first half. However, he was in his roaring self as he picked up a super raid in the final few minutes of the second half to finish with eight raid points from the game. Pawar was the pick of the raiders in the first half from the Panthers as his pace on the mat earned him three points in the opening half while he also made a contribution on the defensive front with a formidable ankle hold to inflict a super tackle on Sachin Tanwar. The burly defender picked up two points in the first half with a strong ankle hold on Dong Geon Lee which was incidentally a super tackle while also adding two raid points to finish with four points. The left corner started off the game well with a decisive ankle hold on Sachin Tanwar and also contributed with a dash to pick two points in the first half to which he added another point and ended with three points. Jaipur's right corner had a poor first half with just the one tackle point as his ankle holds failed to keep the Gujarat raiders at bay and could not improve in the second half with just another point to his tally. Amit Kumar had a poor outing as he appeared a little too keen on tackling and his dashes gifted a few easy points to Gujarat, finishing without a point from five unsuccessful tackles. Mallesh's services were used only twice for raiding in the first half while his one major contribution came in his support during the super tackle on Dong Geon Lee. He was subbed off as Ajit Singh replaced him. The raider came on as a substitute late in the first half, in place of Mallesh but was used sporadically for a few empty raids. The youngster put in a valiant effort on the Do or Die raid to collect a point but was brought down by Bhainswal's ankle hold. The lanky raider was used for just the one raid in this game from which he was brought down by the chain tackle from Gujarat. The Kenyan was also used for just the one raid as he was snapped up by Parvesh Bhainswal on the left corner.